© Nathan Barry for Smashing Magazine, 2013. Here's some statistics we've seen this week, for your delectation. Six second gold; the number of Vine tweets per second doubles in the last two months. Unruly now helpfully compiles Vine metrics. Vine currently has more than 13 million users. Number of tweets containing a Vine link has risen from five every second during April to nine every second during the first three weeks of June. Branded Vines are four times more likely to be shared than video ads. Factors that affect search: ch..ch…changes. Searchmetrics’ analysis of social signals looked for correlations between social activity and search ranking, with the obvious caveat here that search begets social, and vice versa. Google plus ones correlate more strongly (a correlation coefficient of +0.4) with ranking than any other social media signals. Facebook shares were the second most closely linked social signal with rankings - a correlation of +0.34. Tweets on Twitter and Pins on Pinterest have lower correlations of +0.28 and 0.29 respectively. The research goes on to look at keywords and their location. Search experts have long believed that sites that have a keyword in the domain name, such as carinsurance.com or paydayloan.com, tend to rank higher for relevant searches, but Searchmetrics’ study indicates this is now declining in importance. The study found that having a keyword in the domain name has only a low positive correlation (+0.03) down from 0.11 in 2012. Having a keyword in the URL or web page address has declined from a correlation of +0.04 in 2012 to an even lower 0.01 in 2013. And backlinks are growing in importance. Although the correlation has decreased slightly between backlinks and search ranking, this is due to a marked increase in backlinks for some of the topmost search results. Backlinks grow - all the pages ranking in the top 30 positions feature more backlinks on average than last year. 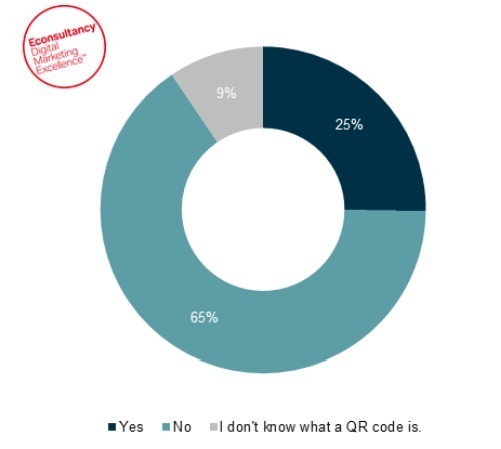 Only a quarter (25%) of smartphone owners have scanned a QR code in-store while 9% are still unaware of the technology. The data comes from a Toluna survey of 1,000 UK consumers, the full results of which are included in our new Mobile Commerce Compendium. Research on the public awareness of Bitcoin was conducted by On Device Research in association with st-art, the organisers of the upcoming Bitcoin London conference. A quarter of Americans questioned in a recent poll said they had heard of Bitcoin, 16% of these Americans have more trust in the digital currency than the US dollar. In Argentina, 73% of respondents who have heard of Bitcoin trusted it, with 22% having more confidence in Bitcoin over the Peso. 32.2% of Brits are aware of Bitcoins. 69% of Bitcoin-aware Brits trusted the digital currency, with 14% having more trust in it than the Pound. The website is firmly in the boardroom, but data only has a foot in the door. Nearly 85% of board meetings cover performance of website, but less than a quarter make changes based on sophisticated data. 85%t of marketers are solely using a free analytics platform, while only 16 per cent have invested in paid-for platforms. 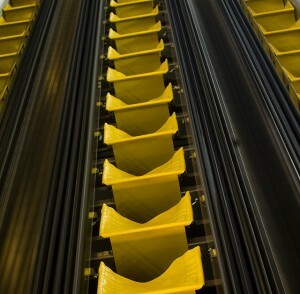 Only 2% use a marketing automation platform. 13% of marketers use visitor identification software. As we pray for an Indian summer, Greenlight analyses energy-related search terms. In April, 235,050 queries were made by consumers searching for Energy-related terms on laptops/desktops and mobile devices (tablets & smartphones). uswitch.com was the most visible advertiser for Energy-related searches on mobile devices, achieving a 90% share of voice. 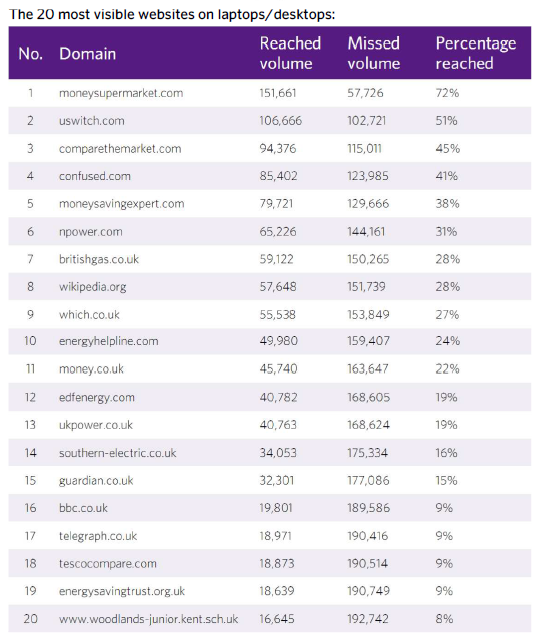 moneysupermarket.com was the most visible website for Energy-related searches on laptops/desktops, achieving a 72% share of voice. The chart below shows the most visible companies across paid media and search, for energy related queries. 90% of luxury retailers are offering in-store video, compared with less than half (44%) of high street retailers. 30% of luxury retailers have trialled transparent screens in stores and no high street retailers have done so. 20% of luxury retailers feature RFID microchips in items of clothing for shoppers to interact with, compared with no high street retailers. 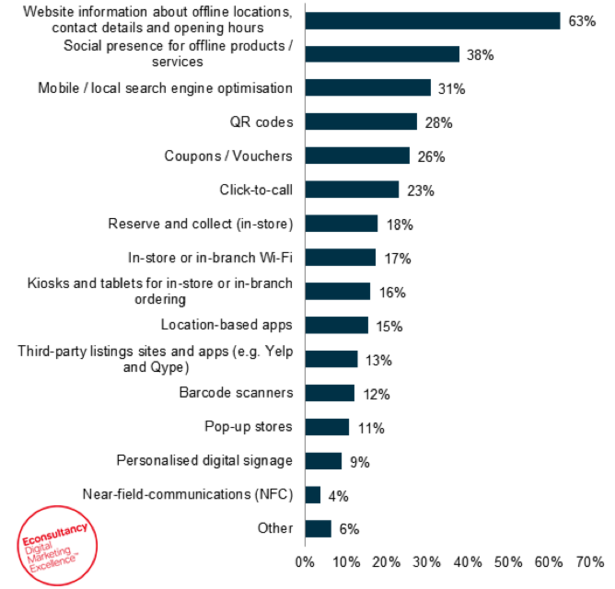 33% of high street retailers offer in-store Wi-Fi and 20% of luxury retailers provide this. 40% of luxury retailers use tablets in stores, while 33% of high street retailers are doing so. 44% of luxury retailers don’t have transactional mobile sites. Of those that do have transactional mobile sites, 56% offer product videos across their mobile stores. All of the high street retailers allow shoppers to purchase via the mobile channel and just 22% of these offer video. The best day to email depends on the market,and first movers into creative email programmes could enjoy success. A study by Experian looks at email opens, clicks and engagement. Findings show that markets vary in terms of best days to undertake email activity. It's also the case that some countries, such as Spain are trailing with regards to implementing more creative programmes, such as cart abandonmnet emails. During the holidays, India and France experienced lower opens and clicks for weekends than weekdays. In the United States it was the reverse occurred, with higher engagement on weekends. Australia, Singapore and New Zealand all have higher engagement during weekends than weekdays, yet Asia Pacific markets such as Singapore, Hong Kong and China are not deploying a large amount of holiday emails on weekends. This might be a great test factor for email marketers sending to countries in Asia Pacific in order to optimize open and click rates of campaigns that currently are being deployed during the week. Abandoned cart campaigns typically produce high response rates, especially in Spain where click rates during the holiday season were 13.2 percent. However, many retailers in Spain are not using this form of remarketing, but should consider doing so especially during the holiday season. Birthday emails around the holiday season also can be used to catch buyers in a “gift-giving” or “gift-receiving” mood. They are an easy win for email marketers, yet no Asian brands are employing this tactic. 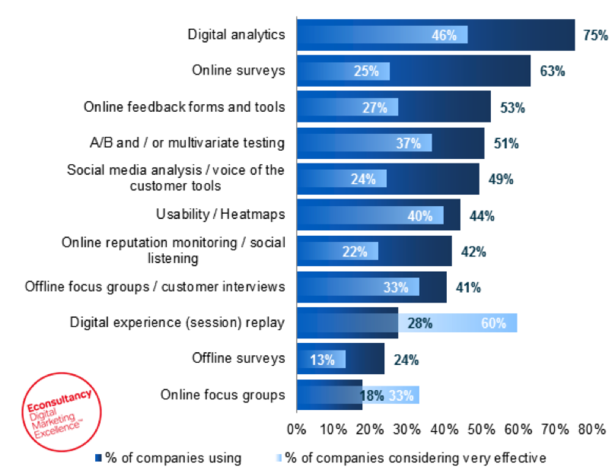 Econsultancy's Reducing Customer Struggle report, in association with IBM Tealeaf, contains some great insights into what methods companies are using to test custoemr experience, and which they think are effective. How do companies integrate online and offline worlds? The same report contains some interesting findings about which offline/online tech is being employed by companies. Growing your house list is a great email marketing tactic to nurture prospects until they’re ready to buy. It’s also a great way to constantly and consistently provide your community with valuable, compelling content to keep your brand top of mind and to grow your authority as a thought leader in your space. So how exactly should you go about growing your house email list so that you can use it to its fullest potential? One of the most appropriate and effective ways to grow your contact list with leads at the top of the marketing funnel is to find need through education. Creating downloadable content like eBooks, infographics, podcasts, videos, whitepapers, revenue calculators, etc. can help connect you with prospects who are in the research phase. A note on lead quality: If they weren’t looking for some sort of a solution, why would they download the content in the first place? While these may not be the most sales-ready leads, they’re great for email nurturing and many times warm up and convert to customers down the line. This is the simplest way to grow your contact list. Any company can do this by creating a simple form and placing it on your homepage, Contact Us page or making a call-to-action graphic linked to a landing page. 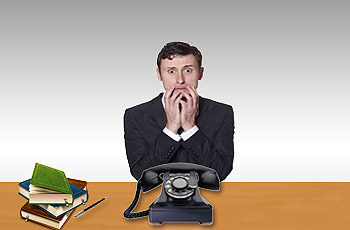 This helps prospects who aren’t the type to pick up the phone and call the sales line. Typically they prefer to communicate via email have you call them. If you have a website and are offering a service or product, this is the most important form you can place on your site. Prospects who fill out this form can be on any side of the hot-cold lead spectrum. The majority will be sales-ready leads in buying mode or want a consultation before buying. Some will be spam or trying to sell you something themselves. A great way to convert leads who are a bit beyond the research phase is to create calls-to-action on pricing and product pages where prospects can get more in-depth information about pricing and product specifications. Many companies already have the pricing and product brochures published, so creating this campaign is very easy. Just hide the pricing / product page and link to them from a landing page so you’re sure to capture that valuable lead information. A note on lead quality: Prospects who are doing their due diligence and researching pricing or products tend to be sales-ready leads and are usually willing to take a call from a sales person. These leads should be scored higher in your lead intelligence or analytics system. While a webinar is more of time and resource investment, it can help you cast your net further. Webinars will drive new leads who are sales-ready and some who can be put into an email nurture track. A webinar can be in the form of a free class about your product, problems or questions surrounding your product or industry. There are several services that specialize in hosting and advertising webinars, including BrightTALK, GoToWebinar or ON24. A note on lead quality: Typically, webinar leads are quality sales-ready leads or leads deeper into the research phase. When a prospect attends a webinar, they’re investing their time, which means they have more need than someone who simply downloaded a free guide. All of these leads should be followed up with by a sales rep and put in an email nurture track. A great way to grow your list and learn more about your market is to offer a promotion, giveaway or contest, like a chance to win a free iPad for filling out a survey or subscribing to your blog. A giveaway can help bring more awareness to your brand, product or service. It also helps build your community. A note on lead quality: These leads are typically not sales-ready, but great for warming up with email nurturing and eventual calls from sales reps to qualify them. The post 5 Ways to Grow Your House Email List appeared first on Optify. Ever wondered what does inblund marketing include ? Well waht better perspective to tell it from an inbound marketing company that help companies get found and maximise their return from digital marketing. Traditional outbound marketing agencies have relied on broadcasting message to individuals or companies that represent a certain target profile or market segment using mainstream media. However, there is no guarantee with this approach that members of these audiences are actually in a position to buy or even consider your product or service in the first place. On the other hand people that are actively seeking your product or service or wishing to learn about their situation or problem in order to understand what product or service they may need are potential customers that you should be engaging. The Internet is the arena where Inbound Marketing comes to life as its where potential customers seek out knowledge and potential suppliers. The Internet however is a complex and fragmented marketing arena which is why specialist agencies and technologies have developed to assist companies looking to engage audiences online more effectively. Whilst the right technology will certainly help to improve your results, by itself its not enough, so here is an overview of 8 steps that an Inbound Marketing agency would perform in order to make a significant difference on your online marketing results and help answer the question what does inbound marketing include. Clearly define and differentiated your business. Understand where its going and how you’re going to get there. Define who your business specifically appeals to and why. Detail what triggers will be used to get your business found online. Be clear about why people should buy from you. Describe how its going to be explained. Explain what you need to do to be seen as the leader in your market. Establish a website with the systems for lead generation and content publishing. Produce key content that connects with visitors to your website. Develop landing pages and offers that convert visitors into leads. Build in on-site SEO to improve the chances of being found. Who is your customer and what challenges do they face. Determine who beyond your immediate customers your marketing should influence. What stand or issue can you champion to polarise your positioning. Establish how you will define success. Which keywords, what levels of traffic and the splits between paid and organic traffic. Number of conversions and resulting sales. Positioning in search engines and referrals from social media. Media enquiries, subscribers, downloads and inbound links. Retention and on-going engagement from current and future customers. Search Marketing – How will you get found in local search, paid search and organic (SEO) search and for what keywords and how will you measure it, what landing pages will you need and how will link building be done to increase your sites authority. Social Marketing – Listening, learning and engaging through blogging, crowdsourcing, forums, conversation monitoring, bookmarking, networking and surveys. Content Marketing – What content will you produce to establish your competitive advantages such as articles, blog posts, case studies, eBooks, images and vidoes, webinars and ebooks. Public Relations – Sharing your unique story, creating connections, gaining influence, building loyalty without being solely reliant on main stream media. Connect with market influencers at all levels from analysts to employees. Switching budgets from paying for exposure to paying for engagement. The content that will need to be created to engage audiences. How goals will be reached given current skill levels, competition and commitment. Set realistic milestones and activity to reach goals. Establish customer training for participation and involvement. Set out key editorial calendars and alignment. Complete competitive analysis for benchmarking. Define meaningful metrics that can be monitored and evaluated. Tracking core metrics like leads, sales and loyalty. Monitor key events and triggers to understand their impact on marketing outcomes. Feeding back results into the plan so that it can be updated and improved. A platform is key to performing this activity reliably and consistently which is why various inbound marketing software applications exist to help with this endeavour. Every Marketing Leader wants to avoid getting labeled that they deliver poor leads. 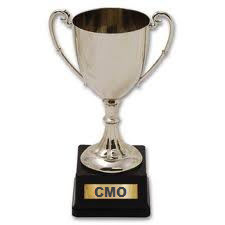 CMO’s strive to run best-in-class programs. They love successful programs. They love industry recognition and awards. That’s why it stings when you feel like the sales team is your downfall. This reminds me of a story from a client this time last year. She uncovered the root problem for sales and helped them make the company number. Sam, the VP of Sales is knocking at Kathy’s door. He was getting beat up by the CEO. The Q2 review did not go well. He said, “My sales managers pointed to the lack of leads as their downfall.” Sam, who is usually very friendly to Kathy, is upset with her. He was banking on a quarterly bonus to take his family to Disney World. Now he’s worried about his job and thinks Kathy’s team is to blame. Marketing proves to be an effective scapegoat. After Kathy had time to reflect, she rolled up her sleeves. She was determined to find a solution to help Sam fix the problem. Not knowing where to start, she started googling. This led her to become overwhelmed with information and noise. She forwarded a few articles to her team to research but nothing earth shaking. Next, she decided to reach out to her peers on LinkedIn. She asked her personal network of CMO friends for advice. Kathy’s turnaround started taking shape after she read a post on lead generation alignment. The tool provided in the post only took her 7 minutes to discover the root problem. Her team and the sales team were in fact not aligned. The 10 Point Checklist for Lead Gen Alignment surprised her of the result. The guidance included deep definitions of world-class attributes of sales and marketing alignment. She realized the specific feedback her team was receiving was just mud. There were no specific details on why the leads were no good. In addition, this root problem uncovered they needed a Return to Nurture program. Even if you think your marketing team is delivering flawlessly. Invest ongoing time in reading and benchmarking against other world-class organizations. Kathy thought her team was perfect and it was all Sales fault. The fault was that both Marketing and Sales were not aligned like she believed. This resulted in poor practices that hurt the sales reps that Marketing was supporting. Just like the routine maintenance on a car, check your alignment often. Download the 10 Point Checklist for Lead Gen Alignment. I recently stumbled onto a hidden flaw in one of the most central concepts of demand generation. It has to do with the classic lead funnel model that we all know and love. You know, the one that actually looks like a funnel and has ever-shrinking sections to illustrate that you start with lots of leads at the top and end at the bottom with…less. The big “Aha!” moment came when someone mentioned that real funnels leverage gravity to draw the material through. But if you tried to use a real funnel in outer space, the material would just sit in it for the most part, and that’s assuming you could get it into the funnel to begin with, because it would not go in by its own volition. So it is with many lead funnels in the B2B marketing galaxy: the funnel just sits there, waiting for gravity to push leads into it and ultimately pull them through the other end. The problem is that leads are people. The only thing gravity does to people is keep them on the planet – it won’t put them in the lead funnel and it certainly won’t pull them through. To make any of that happen, you have to first identify what will drive them into the funnel, and then, what will push them through to the other end. Combine that with the technology to provide reporting and analytics, the people who can make it happen, and the process to keep it consistent. You now have a winning strategy to drive revenue. As I said, it’s not rocket science at all. It’s actually revenue marketing™. So from now on, I will boycott the traditional lead funnel model. Instead, I will use graphics in my presentations that illustrate a left-to-right lead funnel model rather than a top-down lead funnel model. Because gravity is NOT a strategy. Based on several researches about fears, they say that the number one fear for the majority of us is public speaking, followed by death. Who would’t agree? One would rather lie down and let every single cell in his body die down than place himself in front of a very large crowd and utter a single sentence before them. Ridiculous, but true; and cold calling is not an exemption. Considering this situation for instance: a man, who is confident, self-motivated, and a challenger who’s almost always ready to leap the highest mountains in just a single bound is suddenly stuck on his feet and eaten up by his anxieties over a single phone call with the possibility of closing a deal to a prospective buyer? The famous four-letter word is the answer— FEAR. That absurd and bizarre feeling when your in a middle of something wherein you seemed so fully geared up towards achieving something and on a spur of moment, all of these simultaneously collapsed because of the quivering butterflies in your stomach. In the point of view of someone who’s not in the business of generating leads through the process of telemarketing, the mere fact of making a call to a prospect and explaining to him everything about your product is nothing but a petty thing. Anyone can make and take a call. After all, a telephone is just a harmless machine that could not, in any possible way, end your life after a series of phone calls. However, this doesn’t work for telemarketers. For them, there would always be endless factors for experiencing cold call anxiety syndrome that could somehow poison the results of their endeavor. At some point, their hearts beat faster, their hands get too sweaty, and their teeth starts to clinch. Yes, it happens every time, all the time. Nothing is easy and accessible in a blink of an eye, especially in the present time where everything gets complicated including the people; so basically, it is normal to feel agitated at times. No matter how skillful and confident you are in handling certain things, fear is certainly not a crime to be felt and to be experienced. Ultimately, in the world of business process outsourcing, we are all social creatures alike; we all want to be accepted, to be part of the circle, and most importantly, to receive applauses and not boos. Finding new customers is the bane of most salespeople, yet too many times, the reason it is so difficult is salespeople give up too easily. Really, I should say it’s not that salespeople give up too easily — it’s that they just don’t follow-up. For some reason, too many salespeople believe if they make one phone call, send one email or mail one letter to a prospect, then that is all it takes. There is this magical belief that the single communication will be enough to open doors. People who believe that are the same people who believe the tooth fairy is real and there is a pot of gold at the end of every rainbow. Go ahead and say you’re not that type of salesperson, but don’t look too closely into a mirror. You just might see yourself doing exactly what I’ve described: Relying on one outreach to a prospect to be enough. Prospecting requires following up again and again. It’s not a one-inning baseball game. Is there a magic number? No. It varies by industry, customer profile and a number of other criteria. But the number I tell people to start with is six. I believe six contacts to a prospect is the minimum to determine if they might become a customer. The six contacts should be staggered over a period of time, such as one to two months, and should consist of different delivery forms. Each delivery should focus on a different need. Read what I wrote in the previous paragraph. Do you measure up? Most people don’t. Let’s not forget, I said six should be the “minimum.” I’ve had prospecting campaigns run as long as 30 contacts for some industries. The key is to have a plan and to follow-through. The worst thing you can do is to spray your prospects once and then never let them hear from you again. That is not sales prospecting. That is spraying and praying and sorry, but it’s not going to work. The average tenure of a B2B Sales VP is about 18 months. That means roughly one-half of B2B sales VP’s last less than 18 months. Today's post provides ways sales operations can deliver value quickly to a new sales VP. A complete guide will be available for download at the end. Here's part of the dialog from a recent call with a sales operations leader. “Well, do you want to stay with the company?” I ask. “Right now, yeah, I want to stay.” replies Dave. “OK, then, you need a plan when they bring the new guy in. What's the plan?” The question was greeted with the barely audible hum of static on the line. Sales VP churn isn’t getting any better. Impatient CEO’s, Boards and Market Analysts are seeing to that. The fear of the unknown is worse than the known. Who will they hire? What are their plans when they come in? How do they view sales operations? Before the new leader starts is when you need to begin to take action. Scorecard - Distilled, objective data to begin a team assessment. Your data must be rock-solid. It must be reflective of performance / desired outcomes. This is a starting point. Competency and skills assessments must be used to augment performance data. Quick Wins - Identify 2-3 “quick wins” that will have near-term impact for your new leader. These quick wins must also fit into the bigger strategic picture. Be prepared to discuss why these will work and why they are important. Strategic Initiatives - Identify 2-3 bigger initiatives that you’re confident will support longer-term success. Frame out these initiatives. What they cost and what they will return. What is the priority and timing. Who will own them and who’s needed to execute them. Sales Disablers - Identify 2-3 conditions that exist that have a direct negative effect on sales. An example could be low selling time. Redundant reporting platforms. Misaligned or duplicated resources. Ensure you’re looking at things you and/or your new boss can affect. Have a solution set and the business case for each viable solution. Download the complete guide here. Think of this as your 90-day action plan and SWOT for the new VP. Delivered with unimpeachable data and experience that’s objective. Delivered within the first week they are on the job. Make it easy to digest. The more quickly you can help them make progress, the better off you both are. This will provide them with a strategy toward making progress early in their tenure. In addition to the above, there are other items you should package together. Providing the below list to your new boss will further illustrate your value. This list will give your new boss the “lay of the land” for Sales and Sales Ops. Keep these all as brief as possible. Your new boss will be drinking from a fire hose. Sales Process / CRM Overview – Provide a view of the pipeline, the sales process, forecasting and the CRM tool being used. Compensation – Overview of compensation models and exception handling. Include attainment distribution, payout averages, ranges by role, industry benchmarks and cost verses budget. 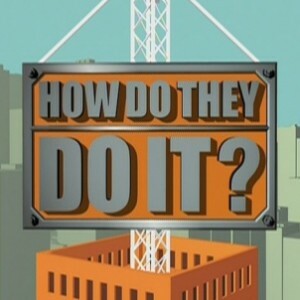 On-Boarding – Summary of process for onboarding, training modules, technology set-up, etc. Sales & Marketing Alignment – Lead Generation, Management, Nurturing and Handoff. Shared KPI’s, etc. Even if your Sales VP’s has not been fired, don’t ignore this advice. Now is the time to put all of this together. If you have strong opinions of what’s working and what’s not, share them. Recognize that a new sales leader will likely make big changes. Help them focus on the changes that will drive tangible results. Before your new sales VP arrives, connect via LinkedIn. See what you can learn about him. Prepare your team. After your VP arrives make them successful. Become their strategic “Chief of Staff”. Help them catch-up quickly and hit the ground running. If you enjoyed this post, never miss one again by subscribing your Email Here and/or subscribing to the RSS Here. Comments are welcome below.